I have tried sending my entries through to 4 Kennel Clubs, I can only get through to one. PLEASE PUT YOUR ANSWERING MACHINES ON IF YOU WANT OUR ENTRIES. I have tried numerous times to fax through with the same result \" NO ANSWER\". Clubs you are wasting my time, paper and ink. A special "Thank You" to all involved with the Transvaal Cocker Spaniel Club Match Meeting at Southern Star Kennels, for a really enjoyable day! The grounds were lovely; spotlessly clean and well manicured with level, very well lawned rings, plenty of safe parking and clean and tidy loos with LOADS of paper hand-towel and a variety of soaps available. The marshalling area was sheltered under a gazebo for the dogs' and exhibitors comfort. The catering was great and inexpensive. The rings were attractively demarcated with burgundy ribbon and big bowls of flowers and my oh my - my wildest dream come true - there was plenty of clearance between the exhibitor's gazebos and the ring, so that visitors, spectators and handlers/dogs could safely stand and watch the proceedings without anyone's view being obstructed, without any threat of dogs upsetting each other AND exhibitor could still put their gazebos up within easy reach and view of the ring! The friendly staff - some members of which competed in the handler class most admirably - ensured that the area remained clean and tidy - no stepping in nasty squishy piles here. So thanks again, everybody, my dogs and I will be back for another day of fun and enjoyable showing next year. Well done! I read with interest the feedback on shows who produce “immaculate lawns”, “attention to detail”, “fabulous venues”, “wonderful prizes” etc. etc. Some Exhibitors are fast to pass positive feedback, which I must add is extremely motivating for the recipient Clubs. Not so positive is the appalling behavior of a majority of Exhibitors, who find it OK not to clean up before they leave after a show weekend, no you did not “pay your fee” so deserve someone to clean up after you…. Our Show Weekend was held on School Grounds and we have to coerce the School Committee to allow us the use of their grounds for the weekend every year. School kids use the grounds for the break time, as well as their after school sports. Would you as parents want your kids to have access to grounds littered with dog excrement, dog clippings and balls of stripped coat, cool drink bottles, take away packets etc. ?? What is wrong with our Exhibitors that they cannot clean up after themselves? I find this disgusting behavior unacceptable. Fortunately there are a minority of people who carry their doggy doo packets and clean up after their dogs, throw away their take away wrappings into provided dustbins and leave the area they used the way they found it. This behavior unfortunately does not rub off onto people who just don’t care! Yes, there is a dustbin for you to find, it’s not good enough to leave your rubbish in a pile next to your site after you leave!! These same people are the ones who drive their 4X4’s through rings, over no-parking de-markated areas, leaving tracks wherever they drive… who cares, they don’t have to face the school management team, who threaten the Committee with closing their doors to our club next year. When one asks these vehicles to move, one gets aggressive commentary back and absolutely no response in following your request!! After a long weekend running a show, with very few helpers (people realize that being on a show Committee is not so glamorous after all), one or two people have to spend 2-3 hours cleaning up after none caring people. It took a very caring Lady, not on our Committee, to come in on the Monday and load a Bantam Bakkie full of dog excrement, picked up off the grounds. This did not include the dustbins! Yes we do appreciate your entries, but I believe people who behave in this way are not welcome to Clubs who work hard to make your show enjoyable. I have been monitoring this forum with special interest in the discussions on “Face judging” and pondered for a long time if I must contribute…maybe the fault is with me, maybe I am just a bad loser, maybe my dogs are not up to standard!!! So I decided to evaluate this year’s show results so that I can be convinced that my viewpoint that many of the South African judges are “Face” judging is right or wrong. If I am wrong, then I will have to acknowledge that I was wrong and that I will have to improve the quality of my dogs. The “Face” breeder (2 puppies) has won 82% of the time and the “rest of us” (2 – 4 puppies) has won 18% of the time. “Face” breeder (2 puppies) has won 25% of the time and the “rest of us” (2 -4 puppies) has won 75% of the time. Do I need to say more…the results have proved to me that the “rest of us” have reason to be upset about the “face” judging by so many of the South African judges!!! Many of the South African judges don’t know our breed or breed standard and as a “cop out” find a safe haven in placing the “Face” breeder because the “Face” breeder has been involved for so long in the “show dog world” and in the past did breed very good dogs. Unfortunately it doesn’t mean that the “Face” breeders dogs are still the best in the ring…is it not a case that the judges lack the courage to admit they don't know either the breed or the breed standard? We have bred some of the top winning dogs in our breed over the last few years and not once have any South African judge or learner judge approached me to discuss our breed and get pointers on what are the important points to look for when judging our beloved breed. I hope that the above results will give our local judges food for thought!!! Why don't the "rest of you" grow up and get yourselves decent dogs as we are tired of your comments regarding "Local" judges! Although I am in favour of lower show fees, and I am probably missing the point, but can anyone please explain to me the reason behind a reduced fee for Veterans ie R30.00, instead of R75.00 or R80.00, when the Veteran is still eligible to compete for the CC and Best of Breed. I don’t understand. Dear Mr. Landsberg it is no wonder, after your sneering & arrogant tirade, that "the rest of us" & others prefer to remain anonymous. It would also appear that judging the wrong end of the lead is as prevalent now as it was from '75 to '95 when I was showing. As you can see from a distance & time I can be very open & honest as I have nothing to fear from the face judges. Not that I ever did need to do so, my breeding & show achievements are a matter of public record. While on the subject of show entry fees, can anyone explain to me why Goldfields is charging more than any other club in the country for their entry fees? At R100 per dog, one would presume they’re offering us something extra special, but I’ve looked through the schedule and can’t find anything. Perhaps one of the Goldfields officials will take the time to let us know through this forum. Sorry Goldfields, I take it all back. I guess I should have checked your current schedule before sending my letter to Dog – World. Apparently people complained on DW before, and the entry fee has been lowered to R85,00. Good – more power to the web!!!!!!!! Arriving at Ashley Sports Club for the KZN Junior KC show in driving rain, we were faced with a field covered in sheets of water interspersed with a few bedraggled tents. We meandered miserably down the drive where most of the dogs and people were sensibly huddled in their cars waiting for a break in the weather. When we reached the ramp to the bottom field, we found the way blocked by a large truck which had been temporarily abandoned by its inconsiderate owner. As I sat peering through the windscreen, I realised that there were two Rottweilers on the back of the truck, both absolutely soaked and with no shelter whatsoever. I just stared in absolute amazement as the truck’s owner returned, moved it out of the way and parked it in the rain again. As we drove off, he climbed out of the truck and walked off. I grabbed the camera and took a photo because I just did not think anyone would believe what had happened. I don’t know what occured after that, but I did report the incident to the Show Committee immediately and, having pointed out the truck which was still parked with the poor dogs exposed to the elements, I suggested that the Show Manager follow up. I really hope the Committee of the Club will actually lay a complaint against this exhibitor. How can we expect the public to take us and our sport seriously when we permit people to brazenly mistreat their dogs on the show grounds and then happily compete in the ring. Whether a complaint has been laid, or not, I am certainly willing to name and shame this exhibitor. The following day he was proudly sitting under a huge gazebo emblazoned with the legend “MIPRET ROTTWEILERS”. 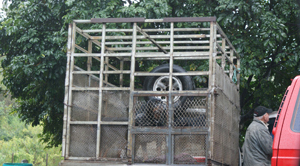 I am also attaching two photographs – one showing the truck with the exposed dogs, as well as a close-up where it is quite clear that the dog was soaking wet and so distressed that he/she was drooling uncontrollably. I agree with Looking for Value. Goldfields is no longer a special show – quite the contrary – it has deteriorated into a moribund little show . I see they have stopped the madness of charging R100 for an entry - its now R85 in line with other shows. Somebody must have seen the light. I find it unacceptable that Toys and Utility have to share judges at four of the five show events during the upcoming Bloemfontein show weekend, and especially that Toys will be done after Utility on all four days. Two years ago in Bloemfontein we had the very same situation, with Toys ending up showing under motor car lights the first day - later even moving further on to show without a ring between parked cars, people walking and kids running through the invisible "ring", to catch some better light from a lamp at the camping area. This was totally unprofessional. I will not expose myself and my dogs to this again, and for this reason I have not entered Bloemfontein . Are the entries really so low in these two groups that they do not justify their own judges at such a so-called prestigious show weekend? I've heard the Bloemfontein circus called many things before, but never prestigious. Leave it to the clowns that have nothing better to do than traipse from town to town - you are much better off at home and you'll also be spared the presence of Bloemfontein 's bellowing buffoon. With reference to your post regarding the Mipret Rottweilers at the KZN Junior Kennel Club Show on Friday, 29th July 2011, I confirm that after you reported the matter to the Office, the matter was immediately taken up with Mr. Jan Pretorius and he was requested to immediately rectify the situation and place his dogs under cover. The KZNJKC does not approve of such behaviour and we trust that this situation will not be repeated in future. This has also been brought to the attention of the Natal Rottweiler Association for their further consideration. Thank you for your concern herein. With regards to Carol Immelman's post I'm sure that our upstanding juniors - Wesley, Louis & co - will never allow something like what was described happen at their show. I am sure a complains will be laid at Kusa and this man will be brought to book. You are not alone.... The Gundogs & Herding also have to share a judge at all 5 shows. The most miserable part is that for the "prestigious" event of the Nationals we have a LOCAL judge who knows the local politics and the local winning faces, with total disregard for any of the other dogs !! I have also not entered Bloefontein weekend !!! 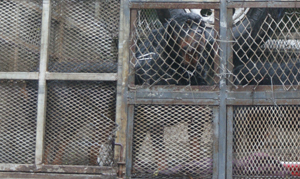 Ever since I have been going to the Natal shows at Ashley, the same Rottweilers (maybe others as well) have been transported in the same truck to ALL the Natal shows. What you describe is nothing new, come rain or shine, they are only removed to enter the ring & then returned to the truck again ! This seems to be quite "normal" for the breeder/owner of these dogs. Regarding the mistreated Rottweilers at KZNJKC, I have read the responses on DW and have also taken note of the comments in emails sent directly to me, and those made in telephone calls to me. The one thread running through all these communications is that this “happens all the time”. If so, then I fail to understand why the dog folk have not taken any action to put a stop to the offending practice. Surely by tolerating this type of behaviour at shows, and by continuing to look the other way, we are tacitly condoning it. Although I’m pleased that the matter has been brought to the attention of the Rottweiler Club in KZN, it is not quite clear to me what the club is expected to do, other than perhaps having the powers to expel a member. However, I can’t see expulsion stopping this exhibitor from carrying on as usual. I’m also relieved that show officials of KZNJKC asked the man to sort his dogs out when I reported the abuse, but I wonder if this will prevent a repeat performance. In any event, why should this exhibitor be allowed to get away with even one incident of such blatant neglect of his dogs? What will it take to galvanise the dog fraternity into action? A visit from the SPCA to the show grounds? This is hardly the publicity our sport needs. KUSA has the power to ban this man from showing and registering his dogs if a complaint is laid against him and he is found guilty. KZNJKC and other clubs have the power to bring a complaint under Schedule I of the KUSA Constitution at no cost. All that’s required is the will to do so. I would be happy to provide an affidavit and so, I am sure, will others who witnessed the appalling abuse. I shall also be prepared to supply enlarged versions of the photographs posted on DW which clearly show the dog’s distress. We can no longer afford to turn a blind eye to injustices and abuses which have become part and parcel of our sport. If we don’t clean up our act, it will be done for us with dire consequences for those of us who responsibly keep several dogs in order to show competitively. Is Mr Jan Pretorius any relation to Mr Chris Pretorius, or is it just a coincidence that they have Rottweilers and a surname in common? Any thoughts from Mr Chris Pretorius on the conduct of his namesake? What’s the Rottweiler fraternity’s take on all of this? Mr Van Hattem? Mrs Carter? Mr Perkins? Mrs Smit? Mrs Bodenstein? In general it seems that Open shows are for learner Judges to gain experience of the handling of different breeds. Also to conform to KUSA regulations re their judging procedures and hopefully become qualified as Championship show judges in South Africa and represent their country around the globe as a championship show judge. Exhibitors bring their youngsters to gain experience of shows after their initial show training classes. New exhibitors come and hopefully enjoy their day and will continue with the sport. Others come as they love the showing and day out. This last weekend such shows were held. In one breed that I witnessed, the steward called out a class in which there was just one entry. After three calls required in the KUSA rules the exhibit was marked absent, the next class was then called which was open, again just one exhibit. Therefore this exhibit should have been BOB. Suddenly running from another ring came the handler and dog from the previous class which had been marked absent. The judge allowed the dog to be judged, there only being two exhibits of the breed promptly gave the exhibit that had been marked absent BOB. What example does this give to a learner steward who has done what is expected as per KUSA regulations marked the exhibit absent? We are reminded quite firmly that we will be called three times, if we do not appear, we will be marked absent and unable to have our dog judged. That it was an open show should not make any difference it is the forerunner of the learner judge to hopefully go on to Championship level. In reply to Observer regarding the late arrival of a dog for its class – I do not know what breed/group you are referring to, but it was probably one of my dogs. I have always tried to support Open Shows, firstly to give show experience to my dogs and secondly because we are asked by the clubs to support our learner judges with EVERYTHING that we have – the good, bad, ugly and old. This weekend with 2 shows being held with only an hour difference between starting times, confusion and clashing was bound to happen. Rings were also not in their “usual” positions, and my breeds were on opposite sides of the field. I tried to inform stewards of the predicament I would be in – I just knew I would be in one ring as I was called in another. In fact for the one show, my one breed was not even on the stewards/judges judging list! So I had raced across to marshall for my class only to be told I was not entered for that show. I had exhibitors ringside even coming to fetch me whilst being judged in one ring to let me know that our breed in the other ring was being marshalled. Under the circumstances, I think the clubs should rethink doing doubles like this again. Swartland & West Coast have the right idea: one show in the morning and the 2nd in the afternoon. If you only have one dog and one breed, maybe it worked for you, but for those of us with more than one dog and breed in separate rings it was a complete and utter disaster. I am sorry that the Ring Steward was given a wrong impression of how shows are run, she was of course correct, but under the circumstances I think that a little leeway was also in order. If you are referring to the Gundog steward, may I just add that I thought she was BRILLIANT and I would love to have her contact details for future shows. As the “aggrieved” Owner/Exhibitor in the “late, marked absent” incident I would like to add my take and comments on the events of the day. The Breed was Labrador Retrievers at the Hottentots Holland show. Firstly, being in the ring at the time and still “under judge’s orders”, I was not even aware of what had happened. It was only afterwards that I learned from others around the ring what had taken place. I fully agree that Open Shows are the venue in which inexperienced Exhibitors, Handlers, Ring Stewards, Judges and Dogs learn their “trade” and have myself always entered as many of these shows as possible both for my own benefit and for the benefit of others. I agree strongly with Observer as such, that the Rules should be applied and adhered to – if we don’t, what message do we send out to the Learners? Given the circumstances of the day I have no objection to a level of leniency however I strongly feel this should be “before the event” rather than “after the event”. The Handler, as she points out, is experienced as both an Owner/Exhibiter/Handler and as a Ring Steward (I would venture one of the best Ring Stewards I have experienced). The Owner/Exhibitor of the other dog is also well experienced. With potential for conflict why did not either or both notify the Ring Steward/Judge in advance of the situation? Also, under the circumstance, would it not have been common courtesy to consult me in the matter – the Judge, while presumably still learning his trade, is a well known Breeder and experienced Exhibitor/Handler who must surely be well aware of the Rules? I would also like to say that when I approached a Hottentots Holland committee member (unfortunately I do not know her name) about the incident I was treated sarcastically, called an emotional, poor loser and was told that it would cost me a lot of money to complain. I was flabbergasted at the attitude. There was little to be gained by having the decision reversed. It was not a Championship Show, I do not use the Sponsors products and what is the worth of a ribbon where only two dogs were entered (personally I would be embarrassed to display it). I was later able to speak to the Show Manager and hope that he will pursue the matter in the spirit of my original intention – that the incident be used as teaching/learning exercise for those involved. Another major show weekend has passed, and yet again another weekend with grossly unacceptable behaviour from some. Being unable to attend the KUSA National Weekend in Bloemfontein personally due to work commitments, I arranged for my daughter to attend the weekend with her new Samoyed puppy together with good friends who were travelling to Bloemfontein for the weekend. By all reports from both my friends and my daughter, a super weekend was had by all, until Sunday morning. At about 8.00am on Sunday morning I had a call from my daughter, to report to me that there had been an incident between our friends and the Show Manager, culminating in my friends being sworn at by the Show Manager. As I was busy on the phone talking to my daughter, I heard the Show Manager proceed to shout at my daughter, and then to physically threaten her! Apparently all of this because he had overheard my daughter telling me what had happened earlier! It was only after a few hours and numerous phone calls to various people at the show that I finally was re-assured that my daughter was in fact alright, and that she was not in any danger from this buffoon! This matter has been taken up with KUSA. I find in absolutely unacceptable that we can allow such behaviour at a dog show, especially from the appointed Show Manager. We must NEVER EVER allow that our juniors (the future of our sport) are intimidated and physically threatened in this fashion. To all of the exhibitors: it is time we stood together against the minority in our sport who constantly and continuously strive to assert their particular brand of buffoonery at any cost (usually at the cost of one or more of us who actually enjoy the competition, the dogs and the social event at any dog show). To the Show Manager: Martin Beckmann, shame on you for publically picking on a young girl, being so abusive and threatening to beat her up (the language used here has been cleaned up considerably!) simply because she chose to tell her dad what had happened that morning. Shame on you for bringing KUSA and the Kimberley Kennel Club into disrepute by losing control in the way you did whilst being an officially appointed public representative of these organizations. Shame on you for not being able to control yourself to such an extent that you actually became an embarrassment to many of those who either saw, or subsequently heard what had transpired between you and my daughter. A public spectacle such as this demands a public apology, Martin. I challenge you to stand up and be man enough and apologise to my daughter unreservedly for your disgusting behaviour, on this forum, and as soon as possible. I guess only time will tell. My assessment of this all is that the measure of Mr Beckmann's character and his good sense will be directly proportional to the speed with which he publishes his apology here. To all those at the show on Sunday who took the time to console my daughter and to see that she was alright and safe, a big THANK YOU. This past recent “KUSA weekend shows”:- there certainly was sadly many “fiasco’s” going on from Administrative issues, to Stewarding issues, Eventing issues, to name but a few. Could we have an answer to where our entry fees have gone? Has this gone to KUSA or have they gone to the Free State “in name only” clubs, PC? It would be wonderful to see the KUSA Championship show as well as the Nationals and a joint FCI show back alternating in Provinces having a turn for some exhibitors that cannot travel to this part of S.A. namely Bloemfontein and especially in Winter being cold and with dreary dry fields. Consider those who would appreciate entering for a change in their own provinces? Why not put a note out well in advance to those exhibitors in a province to assist the KUSA administration on the day and I’m sure you would have plenty folk out their willing to assist as there are many capable people who would meet the needs of the Administrative and Stewarding for these shows, not having to ask the same old same old (who believe the own these rights). Have some new capable blood / sweat and tears folk. SIMPLY ASK FOLK TO VOLUNTEER TO ASSIST and I’m sure many folk would come to the party. It was noted that some Clubs were not adhering to Schedule 3 Regulation 5.10.2 with regard to the order of judging. It is a requirement that where this differs to the order of the breeds listed in Schedule 2 Appendix ‘A’, this shall be clearly indicated on the Show Schedule. Ensuing discussion indicated that it appeared that accommodation was being made for handlers who exhibit in more than one Group. As previously recorded by Exco, the Regulations must be adhered to and such exhibitors should ensure that they have enough handlers. In other words, you may not change the order of judging at a show, and that applies irrespective of whether you are the Judge, the Ring Steward, the Show Manager or an Exhibitor with a 3-way clash. Several people are aware that I objected when the order of judging in the Herding group was altered at Bloemfontein Kennel Club and ultimately caused the original order to be reinstated. Although I was not personally affected on that occasion, I protested as a matter of principle, because everyone forgets that when you change the order to suit one exhibitor, it inevitably impacts on other exhibitors who also show, handle or assist in more than one breed. Changing the order of judging in one breed creates a domino effect, just as it did on Thursday at NFSKC. For some reason, Rottweilers were swopped with Siberians, which resulted in a clash for two exhibitors who showed Siberians as well as Samoyeds. Consequently, the decision was made to move the Samoyeds on Friday. There are dozens of exhibitors who are involved in several breeds and there is no possibility that you will ever avoid all their clashes, especially at the smaller shows, so please don’t even try. What’s more, it’s really unfair to solve the problems of those who make the most noise at the expense of those who just make a plan to get to the ring and show their dogs when they’re supposed to. Club Officials, please leave the order of judging as it is in the Show Schedule. Exhibitors, please have a backup plan if you are showing more than one breed. To tamper with the order of judging on the day of the show is in direct contravention of KUSA rules. Grant, I am so sorry that your daughter Heather received verbal abuse by the show manager. She is a young lady and I know that she is not used to that kind of treatment. The whole weekend was full of funny business and shocking show results. One Judges handbag was kept in an exhibitor tent and surprise surprise guess who got all the tickets and groups. Ethics definitely took a back seat at the KUSA weekend shows. We the exhibitors must thank the three ladies in the tent who under the circumstances did a wonderful job of making sure the numbers were given to us and yes I had numbers missing, but with a bit of patience by myself I received them in time to show my dogs. I must congratulate all those people who walked their little darlings and neglected to pick up the poop afterwards. If that’s how you treat someone else property what does your home look like? It was like walking in a mine field. You people who refuse to clean up after your little darlings are the ones responsible for us not being able to get certain grounds. I for one, hope you are happy. To the PERSON who ran a limping dog in 4 shows just to make sure he got the CCs how low and cruel can you get, winning must be like an adrenalin rush for you. I hope at least you can afford to take this over 8 year old to the vet when you get back home. To the people whose winnings were not done honestly, the other exhibitors are not stupid and know what you do to win. Shame that winning means so much to you, showing dogs after all is a sport. I am so sorry about the verbal abuse that Heather was subjected to by the Show Manager, she was in our care and is a 17 year old newcomer to dog shows. Heather was not the only one who was verbally abused by Mr Martin Beckman, the show manager at all four shows in Bloemfontein this past weekend. Mr Beckman told my husband to .."F..k off....then as my husband turned and walked away, Mr Beckman was overheard saying "Dickhead". What a wonderful display of unacceptable manners from the show manager. He not only verbally abused my husband as well as Heather, he also verbally abused a number of exhibitors around the Working ring. A petition was drawn up addressing the point of "Ethic's", no names mentioned just pointing out irregularities that were happening at the show, this was handed personally to Mr Greg Eva. I can only assume that the Show Manager also read this petition and this must have touched a very tender nerve, as he subsequently became abusive towards a number of the exhibitors who had signed the petition, my husband being one of them. All was reported verbally to Mr Eva on Sunday morning, and we will be following it up officially in writing to Mr Eva. I would urge all those who have had a similar bad experience from officials at the shows this past weekend in Bloemfontein to do the same, and send an e mail to Mr Eva, requesting a response. I can only echo the sentiments expressed by Carol Immelman on the subject of clubs, or their officials, changing the order of judging. Allied to this is the request, not infrequently directed at judges, to "hold" judging because some or other exhibitor is busy in another ring. To obviate any confusion or misunderstanding, I need to state clearly and unequivocally for the record that, as a judge, I shall not entertain any such request. Having learnt a hard lesson many years ago, I have since consistently refused such requests and shall continue to do so. It is only fair that I alert clubs to my uncompromising stance on this in the unlikely event that they should consider me for a judging assignment. I do not believe in inconveniencing the vast majority of those who had paid money for my opinion, and possibly causing their failing to turn up in another ring, in order to accommodate one or two people who had planned poorly. I appeal to my fellow judges to also take a firm stand on this in order to stamp out a practice which ultimately only leads to grief and disgruntlement. The single loser in this scenario is always the judge. In response to Grant Muhl's post ­ I too was a victim of the Show Manager, Martin Beckmann, at the past weekend's shows in Bloemfontein. At KUSA Nationals on Saturday afternoon, whilst waiting to enter the ring with my dog for the Nationals pullouts, Martin Beckmann (the show manager for the event) stormed towards me, right up to my face, and proceeded to yell in my face and gave me the finger as he walked off. I entered the ring with my dog, and was fortunate enough to be one of the six pullouts. As the judge selected my dog as a pullout, Martin Beckmann stormed out from under his family and friend's gazebo, climbed over the bunting into the ring, and told the judge, and I quote: “You cannot do that, you cannot do that!". NO action was taken against Martin Beckmann for interfering in the judging process ­ because he was the show manager? At the Nationals event Saturday evening, whilst waiting in the hall to enter the ring with my dog, a friend of Martin Beckmann asked him where a certain dog was. He replied, whilst pointing to me and my dog: "No, that thing got pulled!" He then smirked, laughed and walked away. Referring to Grant Muhl's comment "We must NEVER EVER allow that our juniors (the future of our sport) are intimidated and physically threatened in this fashion" ­ I want to point out that I too am a young woman who has to put up with Martin Beckmann's intimidation, swearing and threats of physical violence. This past weekend has not been the first time that I have had to endure rude behaviour from Martin Beckmann. I have in the past been threatened by him with words like "You better watch your back, you better watch out! ", and "I will break your fingers". How long must we all remain at the mercy of Mr Beckmann's serial breaking of KUSA rules, his personal insults, verbally abusive behaviour and his threats of violence?? Well! Yet another less than perfect KUSA Classic Disaster weekend! The weekend started with an out-of-control, rude, bumptious, buffoon of a show manager who obviously spent his time terrorizing small children and little old ladies and having screaming matches with various people who may, or may not, have disagreed with his alleged show management. Where does Mr Eva find them? and why? how can you appoint a Show Manager who doesn’t know the rules? He was, naturally, rewarded with a KUSA gong. The weekend was distinguished by horrid grounds, bad judges (one at least of whom never bothered to even touch the dogs), an unspeakable, grossly overpriced Nationals supper, a chaotic show office and even more chaotic judge’s sheets. If this system is off the KUSA database, we should all be very, very worried. The feeling on the grounds was that the poorly supported Nationals were in effect, merely a Variety Challenge, and questions were being asked why the National dog couldn’t rather be the winner of the KUSA annual ratings system. Added to all this excitement and joy, was the appearance of the apparently heavily protected Chairman of the Free State Provincial Council. No one was particularly surprised – the feeling being that loyalty, and voting the right way must of course be rewarded. How long has it been since allegations of animal abuse and the mismanagement of the Free State Province first made their appearance in the Open Forum of this website? How long has it been since the Article 19 team completed their investigations? Their findings have possibly also found their way to the infamous KUSA File Thirteen. The entire organization of the weekend was disgraceful and I regret that I supported the event this year – last year was bad enough. I think that if the KUSA Classic is to continue, a completely new team of organizers must be found. I know that if even one of the present suspects from the President on down has anything to do with the 2012 event, I shan’t be entering. I add my voice to those of Carol Immelman and Gerard Robinson - judges, stewards and club management must not give in to "requests" or demands to change the published judging order. In my experience it is usually very experienced (and successful) exhibitors who make the demands. Not only should they know better, it is often newcomers who are inconvenienced. Our hobby needs good role models rather that prima donnas.